The Sea Inside is an example of a ‘big’ European film – a commercial and artistic success, directed by Alejandro Amenábar, the rising star of Spanish Cinema, and featuring a stand-out performance by one of Spain’s leading stars Javier Bardem. An estimated budget of €10 million makes The Sea Inside a ‘bigger’ film than most productions in other European countries (ahead of the UK average for a ‘domestic’ or non-Hollywood film of €6-7 million). In Spain, the film was seen by over 4 million people at the cinema and international recognition led to the award of Best Foreign Language film at the 2005 Oscar Awards. Outside Spain, however, the film was only a minor success in Germany, France and Italy and its UK performance was very disappointing. This raises a number of possible questions. Is the film simply ‘too Spanish’? Is the subject matter not universal? Or is it the aesthetic approach to the film not one that appeals widely? Or is it simply that the distributors’ reluctance to promote this kind of film, especially with subtitles, meant that audiences were simply unaware of its qualities? Interestingly, the film did reasonably well in North America, especially around the time of its Oscar success. The reception of the film might also be viewed in the context of Amenábar’s previous film, the English language (but Spanish-produced) gothic ghost story, The Others, starring Nicole Kidman. The Others was a hit all around the world. Yes it was a popular genre film, but even so, we might question how much the popularity of that film rested on the willingness to accept Hollywood stars in an English-language film in most major markets (although it would be dubbed in some). One of the arguments about the ‘bigger’ European films is that they might work better in commercial terms if made in English. (The notes that follow were written for the short run of The Sea Inside in April 2005 at Cubby Broccoli Cinema, at the National Media Museum. Has any other filmmaker ever had such an auspicious beginning to a career as Alejandro Amenábar? Four films, four box office champs and four critical successes by age 32 – most of us would settle for just one. He writes, he directs, he produces, he composes the music and in this film he edits as well. Yet he seems a modest and personable young man (and one who values a strong team of collaborators). What is possibly even more remarkable is the way in which his cinematic vision has developed and matured so quickly. The first two films, Tesis (1996) and Abre los ojos (Open Your Eyes) (1997) were youthful genre pictures full of interesting ideas and demonstrating the potential for good technique. The Others (2001) showed a director able to take control over both the generic conventions of the gothic ghost story and a cast of children and leading actors, all in a second language. Perhaps it shouldn’t be surprising then that The Sea Inside is a masterly melodrama, beautiful to watch and enriching to experience on every level. There will be tears, but also gasps at the restraint with which a potentially sentimental subject is handled. At the centre of the film is the performance by Javier Bardem. Following his earlier portrayal of a wheelchair-bound ex-policeman in Almodóvar’s Live Flesh, this great physical actor, in his youthful prime at 35, now plays the 54 year-old Ramón Sampedro – a quadriplegic following a diving accident in his twenties. Bardem’s expressions and facial gestures are complemented perfectly by the make-up techniques of Jo Allen. Surrounding Bardem is a fine supporting cast, many of whom have only limited experience in feature films. But this is not something we notice: the cast members work together as convincingly as any ensemble players who know their director well. Like many of the great melodramas, The Sea Inside is shot in a CinemaScope ratio. The wide ’Scope frame allows compositions in which the recumbent Ramón can be seen together with his visitors – and often with a background shot of the landscape outside. A family melodrama is often contained within a single enclosed set, but the compositions here emphasise the wide emotional terrain. The cinematography by Javier Aguirresarobe is one of the many strengths of the film and helps to open out what could become a claustrophobic drama. Melodrama seems to be a dirty word for some critics, but cinephiles the world over recognise the attractions of the genre. There are many definitions of melodrama, but the ‘family melodrama’ deals centrally with the emotional relationships of a family group and expresses these via set design, acting, camerawork and music. All of these are integral to The Sea Inside. Traditionally, the equilibrium of the family is disturbed by the arrival of a stranger or a change in the behaviour of one of the family members – often associated with a social taboo. Ramón has become the central focus of his family. His older brother loves him and recognises his duty to support him – but disagrees fundamentally with his legal fight to be allowed to end his life. His sister-in-law Manuela loves him too – perhaps too much – and devotes herself to his care. His nephew does everything he can, seeing his uncle as a man to respect and possibly using him as a role model to counteract his own father. Ramón’s father conspires with his grandson against his eldest son. Into Ramón’s life (and the family) come external figures. Two women fight for his attention and his love. Only the campaign activist, Gené, and her partner appear to be outside the complex of emotional relationships. 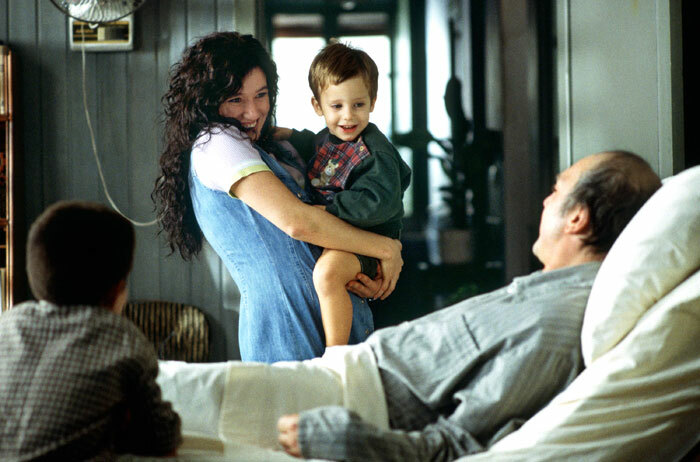 Their relationship and the promise of their new family offer a life-enhancing contrast to the emotional turmoil around Ramón. Music is central to the film as it must be to all melodramas. Ramón chooses opera as an important part of his enclosed world and Rosa plays records at the radio station as a means of communicating with him. Amenábar has again composed music to give texture to the memories and dreams that Ramón experiences – Celtic influenced music that conjures up the Galician landscape and the pounding of the sea. It will probably take several viewings to appreciate Amenábar’s creation of three separate themes: “Rosa the Celtic, Julia the symphonic and Ramón a mixture of both”. The film is clearly located in Galicia and Catalunya, two of the important ‘autonomous regions’ of Spain, far from Castillian Madrid. Perhaps this gives a particular twist to the debate about Spanish law. Certainly it provides distinctive ‘voices’ in the two languages. The main story is located in Galicia and it is here that the landscape becomes a player, not just the coastline, but the rainy valleys inland. At times, the flight (in his dreams) of Ramón across the landscape seems to recall the representations of landscape conjured up by Julio Medem in his films set further along the Atlantic coast in the Basque country. The emotional attachment to the land was further charged by filming on the same beach where Ramón suffered the diving injury that paralysed him and shooting scenes in chronological order to preserve the actor’s sense of the developing story. What is the film ‘about’ (i.e. apart from the family melodrama)? Ostensibly, this is a film about the right to die with dignity. The real-life Ramón Sampedro, on whose story the film narrative is based, spent 28 years fighting for the right to do what he wanted. Yet the film is never despairing or depressing. Indeed, as many commentators have noted, it is an uplifting film that could be seen as primarily about love and freedom. The title, The Sea Inside, comes from one of Ramón’s poems. Amenábar explains it in terms of the importance of the sea to Ramón – before the accident it gave him a life as a sailor, then it took that life away. But the idea of the sea is always with him and it offers the possibility of dreams, dark and mysterious – the very stuff of melodrama. As a major new talent, it is inevitable that Amenábar will be discussed as an auteur. At first glance his four films seem very different. They all refer to different genres but they all focus on what it is to be human and to contemplate death. In Tesis, the graduate student, Ángela, investigates ‘snuff’ movies and finds herself caught up in a thriller narrative. In Open Your Eyes, César loses all sense of living ‘now’ and is unsure if he is alive, dreaming or dead. In The Others, Grace does not know she is dead and refuses to accept the possibility. Ramón finds himself in another scenario where he contemplates death from a position that is both in and outside the living world around him.. The Sea Inside was the winner of the ‘Foreign Language Film’ Oscar in 2005 and it is surprising that Javier Bardem did not receive even a nomination for his performance (although Jo Allen was nominated for her makeup skills). Like it’s predecessors, the film was the Spanish box office champion, easily out-performing Almodóvar’s Bad Education – which has been a much bigger hit in the UK and the US. Perhaps The Sea Inside is ‘too Spanish’ in some way, with Amenábar seeking to appease his Spanish critics for making The Others in English? I’m not sure, but I hope as many people as possible get to see this marvellous film and to make up their own minds. Since The Sea Inside, Alejandro Amenábar has not publicly announced any further work. Perhaps he is just taking a well-earned rest. Whenever he does re-emerge with a property of some kind, there is sure to be plenty of interest. Javier Bardem has several films due for release in the next couple of years. Love in the Time of Cholera (2007) is an adaptation of the Gabriel Garcia Márquez novel to be directed by Mike Newell for New Line. Bardem is part of a mixed Hispanic/Anglo cast and the film is in English. Bardem also appears as the lead in Goya’s Ghosts (2006), – a Spanish film made in English by Milos Forman – and he is listed in a major role for the Coen Brothers’ adaptation of Cormac McCarthy’s No Country for Old Men, again in 2007 and in English. Hollywood is finally beginning to realise that it shares a language with Spain (and Mexico) and this is likely to mean that major Spanish filmmakers may well look West rather than to the rest of Europe. In this respect, they are potentially involved in relationships similar to those enjoyed by French and Italian filmmakers in the 1960s. Alejandro Amenábar is now scheduled to work on Agora, an epic set in Roman controlled Egypt. It is shooting with a budget of €50 million in Malta. The film is written by Amenábar’s usual writing partner Mateo Gil and stars Rachel Weisz. This entry was posted in Film Reviews, Melodrama, Spanish Cinema. Bookmark the permalink.